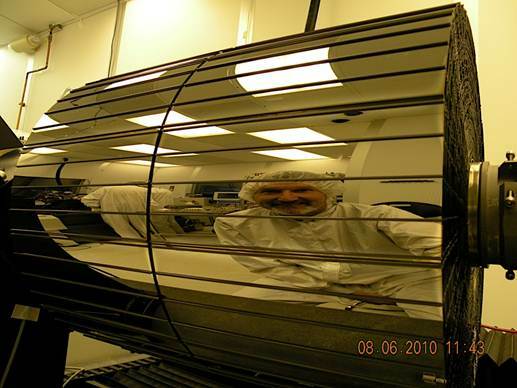 Depth-graded multilayer coatings can be used to construct efficient hard X-ray telescopes for astronomy, as has been done for NASA’s Nuclear Spectroscopic Telescope Array, or NuSTAR mission. As explained in more detail here, the two NuSTAR telescope assemblies (labeled “Optics” in Figure 1) were constructed from thousands of individual multilayer-coated thin-glass cylindrical shell segments, which were then precisely mounted, concentrically, like Russian dolls, to form a highly-nested X-ray telescope. The glass shells were produced by NASA/GSFC, and telescope assembly was completed at Columbia University. 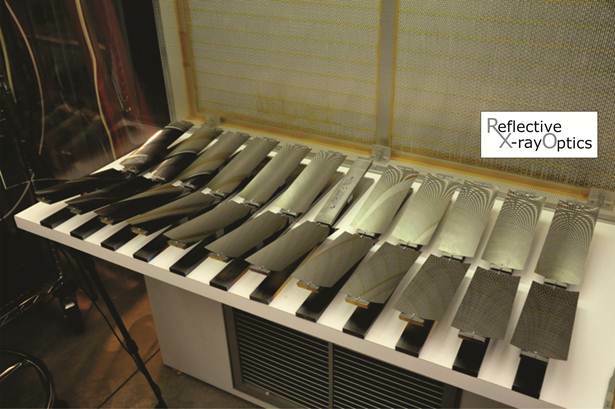 Depth-graded multilayer coatings were provided by DTU and RXO. Figure 1. 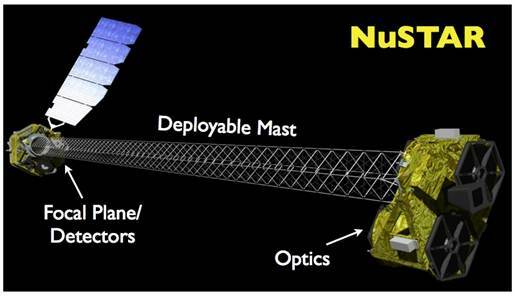 Artist’s conception of the NuSTAR mission, launched in 2012. Figure 2. A NuSTAR telescope during assembly at Columbia University. The telescope is made of 133 concentric, cylindrical primary and secondary optical surfaces; each of these full-cylinder surfaces is in turn made of multiple individual thin-shell mirror segments (like those shown in Figure 3). Thousands of such mirror segments were used to construct the two NuSTAR telescopes. Figure 3. A batch of NuSTAR mirror segments, fresh out of RXO's coating chamber after DGML deposition. Figure 4. Grazing-incidence X-ray reflectance of a NuSTAR witness mirror at θ=0.150° incidence. The measurements were made using RXO's Hard X-ray Reflectometer. The green curve is a fit to the measured data. Figure 5. 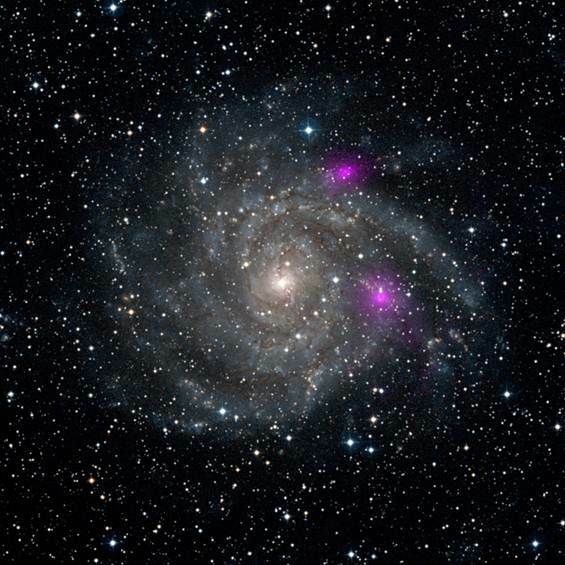 This view of spiral galaxy IC 342 includes high-energy X-ray data from NuSTAR, translated to the color magenta, and superimposed on a visible-light image highlighting the galaxy and its star-studded arms. The two bright magenta spots are blazing black holes. 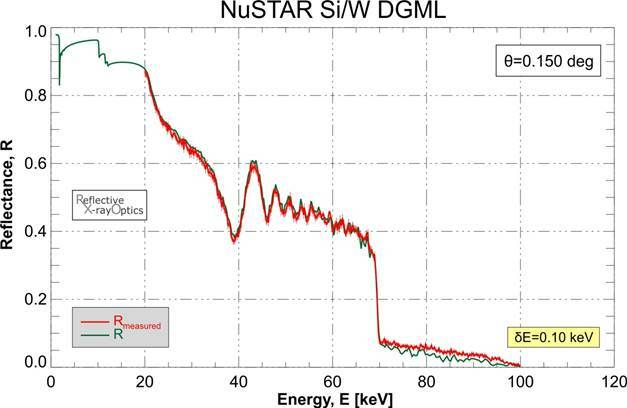 More NuSTAR results can be found here.